WASHINGTON, DC—Today AARP National Volunteer President Dr. Catherine Alicia Georges, EdD, RN, testified on Capitol Hill at the U.S. House Committee on Oversight and Reform about the impact of high prescription drug prices on older adults. “Prescription drug prices are a high priority for AARP and its members. Older Americans struggle to afford needed and life-saving medications. Most Medicare beneficiaries live on modest incomes, with an annual median of just over $26,000. One-quarter have incomes of just over $15,000. One-quarter have less than $15,000 in savings. This is not a population that has the resources to absorb rapidly escalating prescription drug prices, and many are facing the very real possibility of being unable to afford the medications they need. “AARP has been tracking the prices of widely-used prescription drugs since 2004. Our most recent Prescription Drug Price Watch Report focused on brand-name drugs and found that their retail prices increased by an average of 8.4 percent in 2017 – four times the rate of inflation. “Older adults are particularly vulnerable to these trends. Medicare Part D enrollees take an average of 4.5 prescriptions per month, and over two-thirds have two or more concurrent chronic illnesses. “When AARP talks about the impact of high prescription drug prices, we’re often talking about costs that patients will face every year for the rest of their lives. High and growing drug prices are affecting all Americans in some way. Their cost is passed along to everyone with health coverage through increased health care premiums, deductibles and other forms of cost sharing. “In conclusion, current prescription drug price trends are simply not sustainable. Drug companies are working very hard to try to shift the blame to others in the health care system, leaving them free to set incredibly high prices and increase them with little restraint. As a result, we Americans continue to pay the highest brand-name drug prices in the world. Full written testimony is available at https://www.aarp.org/content/dam/aarp/politics/advocacy/2019/01/written-testimony-dr-catherine-alicia-georges-house-oversight-reform-committee-final.pdf. 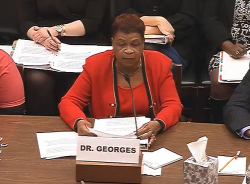 To watch Dr. Georges' testimony, visit: https://bit.ly/2G75fuC.